Today I’m writing my daily letter to a new pen friend, Renee. Renee lives in the Adirondack region of New York state. I met her through The Letter Exchange, that wonderful letter writer’s group I’ve mentioned to you before. Renee and I have a lot in common. We both enjoy spending time with family, reading, cooking, gardening and partaking in afternoon tea. We also share an interest in art, music, history and world cultures. It won’t be hard to think of things to write about in our letters to each other. I hope you too have pen friends with whom you have so very much in common. 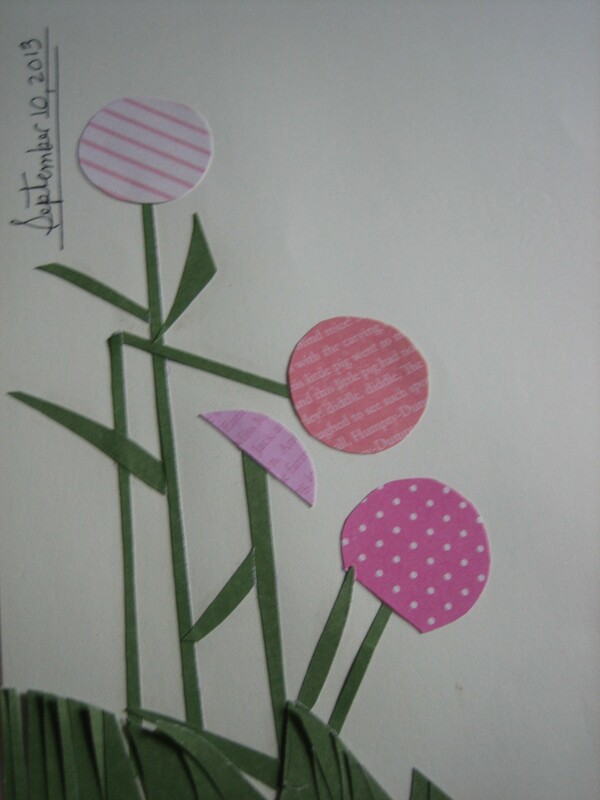 I whipped up some stationery for my letter to Renee, for that’s always a most enjoyable activity in itself, but then I got on with my writing. It wasn’t long, maybe an hour later, that four pages were filled with friendly words. 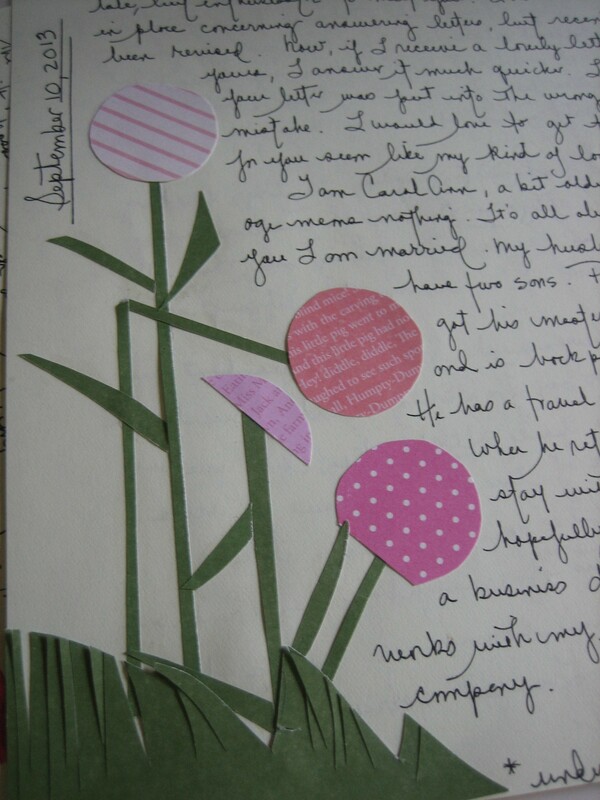 Even without a lot of things in common letter writers manage to find many things to share, that’s because thoughts run freely when writing – from past to present to future to imagination. Letter writing really helps us reach into ourselves as we reach out to others. I’ll have to ask Renee where she stands on fashion, but I know where she stands on letters. She loves them just as I do. 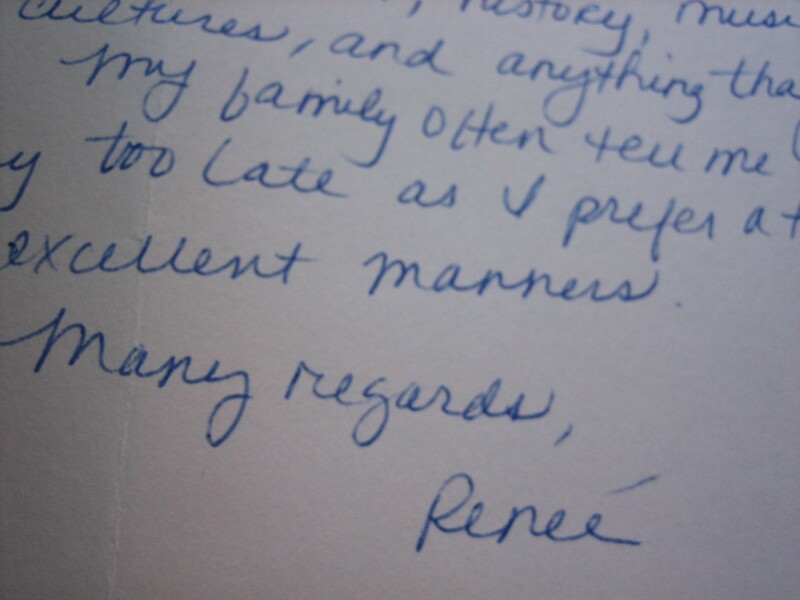 I’m sure Renee gets good mail most every day because she’s a letter writer as I hope you are too. Some people get terrible mail, poor things. All they find in their mail boxes are bills and advertisements and appeals for money. If they’re lucky they might also get magazines and a few interesting catalogs, but so many never enjoy the pleasure of letters. It’s so sad! 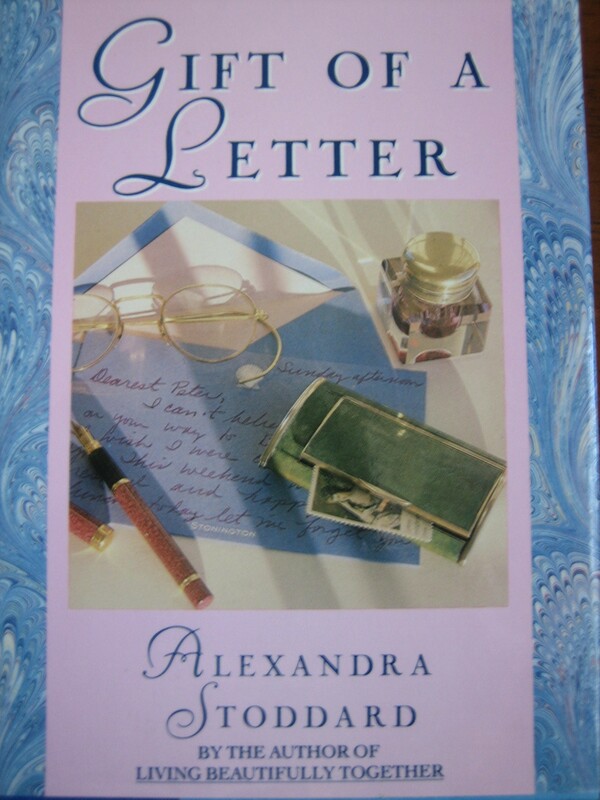 In Alexandra Stoddard’s book, “Gift of a Letter”, she tells about a man who replaced his mailbox with a garbage can. Besides saving steps, he was making a statement for all to see. He felt his mail was pure garbage! Obviously this poor man was not a letter writer. If only my letter writing friends knew his address. We could send him some lovely letters and treat him to excellent mail. We could change his life! One days mail delivery – an excellent mail day! Every now and then I have what I call a “Letter Luncheon”. I had such a luncheon just the other day. You see, I was about to sit down for a little refreshment around noon when I noticed the mail truck pulling up to my door. That little white truck is always a most welcome sight. I dropped everything and high-tailed it to the mail box at my door and “lo and behold“, five pen friends were there coming to call on me. 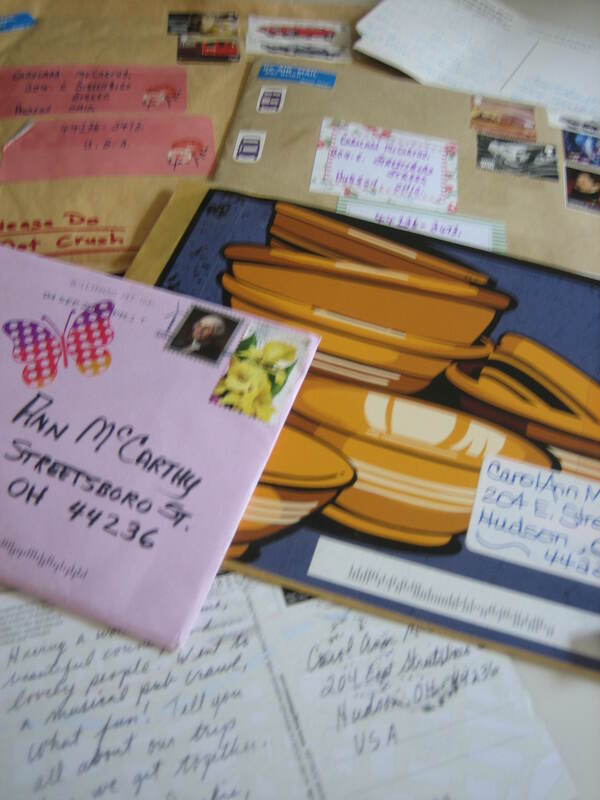 They were there in the form of packages, letters and post cards. I was so happy to see them! That day’s lunch would not need a book or magazine to keep me company. I had Tracy from England, Tamra from Oregon, Amelia from Minnesota, Lana from Montana and Connie who was writing from her trip in Ireland. Oh Boy! Company for lunch! A “Letter Luncheon”! I spread my great mail around the table, and as I munched my salad I had a wonderful visit reading letters from great friends. “Letter Luncheons” are truly delightful happenings because sometimes you may not be ‘up’ for going out or dressing up or inviting living, breathing people over, but you’re still quite ‘up’ for visiting friends in a spiritual sort of way – sharing thoughts, sharing essence. Thoughts and essence are easily shared, sometimes best shared, in letters without any bodily assistance. And this is why many of my closest friends happen to be letter friends (“dead friends” too). In some cases I have no idea what a favorite pen friend even looks like, and I could care less. I wrote to my dearest friend Bruce Youngblood for over ten years before I knew he was black. Who cared what color he was anyway. It’s spirit that counts. Black, white, red, yellow… tall, short, slim, fat… these things matter not to letter friends. But unfortunately, looks will sometimes affect in-person relationships – prevent them from happening in the first place. It shouldn’t, but it does. If you haven’t enjoyed a “Letter Luncheon” lately, OR EVER, (gee that’s too bad), but all is not lost. 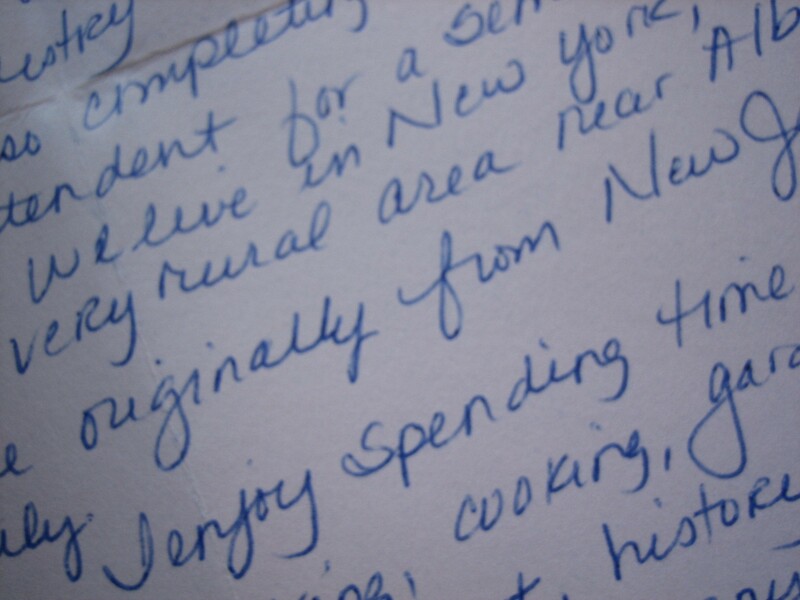 A “Letter Luncheon” could still happen for you if you start writing letters. And you can take the matter into your own hands by creating your very own “Letter Luncheon”. Here’s how: Simply sit yourself down at your next noon time meal with paper and pen at your side. Eat a little, Write a little. Eat a little. Write a little, eat, eat, eat, write a lot, write a little more. You’re writing notes and letters to friends in between bites. You’ll be having your own “Letter Luncheon”! Then send those letters off, and before you know it, the friends you’ve written will be at your door returning the favor of a visit. I can relate to this post. I received three letters on Monday and read them during my lunch. I normally only get one letter at a time but was sooooo happy to receive three at one time!! Gwen, I’m happy you get to enjoy “letter luncheons” too. They sure are fun and they don’t happen often enough, do they? I wonder if Evelyna was one of your luncheon guests.